BlackBerry 10 is a proprietary mobile operating system for the BlackBerry line of smartphones, both developed by BlackBerry Limited (formerly Research In Motion). BlackBerry 10 is based on QNX, a Unix-like operating system that was originally developed by QNX Software Systems until the company was acquired by BlackBerry in April 2010. It supports the application framework Qt (version 4.8) and in some later models features an Android runtime to run Android applications. Prior to version 10.3.1, BlackBerry 10 also supported the Adobe AIR runtime. The user interface uses a combination of gestures and touch-based interactions for navigation and control, making it possible to control a device without having to press any physical buttons, with the exception of the power button that switches the device on or off. It also supports hardware keyboards, including ones which support touch input. On October 26, 2015, BlackBerry announced that there were no plans to release new APIs and software development kits (SDKs) or adopt Qt version 5. Future updates, like versions 10.3.3 and 10.3.4, would focus on security and privacy enhancements only. The BlackBerry Leap is the last smartphone from BlackBerry to run the BlackBerry 10 operating system. In 2016, BlackBerry Limited ceased making smartphones and licensed TCL Communication to manufacture them under the name BlackBerry Mobile. BlackBerry Mobile smartphones abandoned BlackBerry 10 in favor of the Android operating system, beginning with its 2017 BlackBerry KeyOne. The first BlackBerry phone to ship with Android, however, was BlackBerry Limited's Priv. On December 15, 2017, BlackBerry announced that there would be at least another two years of support for BlackBerry 10 and BlackBerry OS devices. BlackBerry will end the support for the operating system at the end of 2019. The operating system was originally called BBX, but this was changed when BlackBerry was blocked from using the BBX trademark after legal action from BASIS International, who already used it for their software. On November 12, 2012, CEO Thorsten Heins announced a January 30, 2013, launch of the BlackBerry 10 operating system version 10.0 and the first smartphones running it. The operating system, as well as two devices, the Z10 (a full touchscreen device), and the Q10 (a device equipped with a physical keyboard), were announced simultaneously around the world on January 30, 2013. The company also announced that the BlackBerry PlayBook tablet would receive an update to BlackBerry 10 later in 2013. Subsequently, BlackBerry stated when releasing their Q1 2014 financial results that the BlackBerry PlayBook would not be receiving an update to BlackBerry 10, citing that the hardware would not provide a good experience of BlackBerry 10 and were focusing on future devices. BlackBerry continued to support and develop the PlayBook with its separate Tablet OS. On 14 May 2013 BlackBerry OS 10.1 was launched. This brought improvements to many features requested by users. On 13 September 2013, in Asia, BlackBerry announced the launch of BlackBerry OS 10.2 and a new BlackBerry 10 device, the Z30, providing performance increases over the previous BlackBerry 10 devices. On June 18, 2014, BlackBerry announced an official relationship with Amazon.com, which resulted in the 10.3 update bundling the Amazon Appstore. On 15 December 2017, BlackBerry CEO John S. Chen announced that there would be at least two years of support for BlackBerry 10 and BlackBerry OS devices. The operating system is expected to be end of life at the end of 2019, with many built-in software packages having their support ended (such as Facebook, Dropbox, Evernote, LinkedIn, etc.). The touchscreen is the predominant input method of BlackBerry 10, in addition to hardware keyboard for devices that have one. Users can use gestures and keyboard shortcuts to navigate around the system. For instance, a user can unlock the device or return to the home screen by swiping from the bottom to the top. Some gestures offer additional modes of interaction when they are used differently. For instance, the same gesture can be used to show unread notifications when the user swipes from the bottom edge to somewhat the middle and slightly to the right and also keep the finger on the touchscreen. Similarly, when the finger is moved from the bottom to the right in a curved motion, the user can enter BlackBerry Hub immediately. Devices with a hardware keyboard can use keyboard shortcuts to reach applications or perform specific functions more quickly. When a user returns to the home screen from within an application, the application is minimized into a so-called "Active Frame". An Active Frame is a miniaturized window of the application which keeps running in the background. A user can return to such an application by tapping on the Active Frame or close it by tapping on the X icon. Active Frames can have widget-like functionality and show small bits of information, similar to widgets on Android. For instance, the calendar application can show upcoming events and meetings. BlackBerry 10 limits the number of active applications and it varies per device. 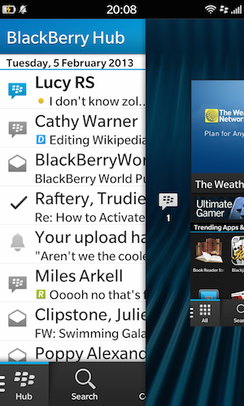 BlackBerry 10 collates emails, SMS/MMS, calls and notifications into the BlackBerry Hub. It shows all messages and notifications in a continuous list, sorted by date. The user can filter results by application or, in the case of email, also by inbox. The user can create, view or act upon messages or notifications directly from the Hub. For instance, when the user opens a Facebook message, the Hub will open a small part of the Facebook application and allow the user to perform the same actions as the Facebook application itself. Applications need to support the Hub specifically to use most of these features, which is only possible for applications written with the native SDK. Notifications from unsupported applications are collated in the generic notifications tab. A virtual keyboard with support for predictive typing and several gestures. Voice control and BlackBerry Assistant (10.3.1 and later), a virtual assistant, with which the user can perform various tasks by voice input or typed queries. BlackBerry Balance, with which the user can separate personal from work data, if enabled by the device's enterprise server. The user can switch between two workspaces, each with their own applications, files and accounts. BlackBerry Link, with which the user can synchronize data between the device and a computer, update the device or make backups. It supports iTunes and Windows Media Player. BlackBerry 10 has a number of applications that help users perform various tasks and activities. These include a web browser, as well applications for notes, reminders, calculator, clock, music, media, weather and file management. Cloud services like Box and Dropbox are also integrated by default. In addition, BlackBerry's messaging service BlackBerry Messenger is included, which supports video chat, VoIP and screen sharing. BlackBerry 10 can run applications that were written with its native SDK, Android applications compiled for API levels 10–18 (support varies per version) and applications written for Adobe AIR (only supported until version 10.3.1). BlackBerry 10 provides the distribution platform BlackBerry World as well as the Amazon Appstore (on version 10.3.0 and later). Since version 10.2.1, Android application packages can be installed directly, whereas on previous versions Android applications could only be installed through BlackBerry World or by sideloading, which required packaging such applications into a native package format (BAR). At release in January 2013, BlackBerry 10 had 70,000 third-party applications. At the 2013 BlackBerry Live conference, BlackBerry announced that they had more than 120,000 applications. Some developers have offered applications to access the Google Play Store, although this is not sanctioned by BlackBerry or Google. Applications which depend on the Google Play Services framework may not run. Similarly, Android applications which require a newer API level than 18 cannot run on BlackBerry 10. BlackBerry 10 supports the following BlackBerry smartphones, all of which can run the latest version. The BlackBerry Leap is the last smartphone from BlackBerry to run the BlackBerry 10 operating system, as BlackBerry devices are now running Android instead. Building up to the launch, the company made substantial changes to how it had previously engaged developers, being substantially more active at courting developers, solving issues and being transparent about development updates. The company sent two teams to engage developers. The first, focused on acquiring premier applications from third parties. The second team focused on engaging the broader development community and building the platforms application count. In May 2012, the company released a prototype touch screen smartphone to BlackBerry developers as part of the BlackBerry 10 Jam Conference in Orlando, Florida. The Dev Alpha A' device, which resembled a small BlackBerry PlayBook, ran an early version of the operating system and was provided as a means for developers to develop and test their applications on a physical device. In September 2012, a second developer prototype was released in September 2012, known as the Dev Alpha B. It includes a faster processor and a number of internal improvements. A third developer device, the Dev Alpha C, was announced on November 29, 2012, and is the first developer prototype to demonstrate the physical keyboard capabilities of BlackBerry 10. Acquisition of a Dev Alpha C device is based around a point system, meaning that developers who have previously developed apps for BlackBerry, or have had the Dev Alpha A/B devices, will have a higher chance of receiving a device than a new BlackBerry developer. It was released at the BlackBerry Jam Europe 2013 event in February 2013. Pre-launch "Portathons" held by BlackBerry have received up to 19,000 applications submitted per weekend. Reviews of BlackBerry 10 have been generally positive. David Pogue of the New York Times noted that the software was, "simple to master, elegantly designed and surprisingly complete. It offers features nobody else offers, some tailored to the corporate world that raised BlackBerry aloft in its glory days." Walt Mossberg of the Wall Street Journal referred to the operating system as "logical and generally easy to use". Mossberg praised the virtual keyboard, camera software, and messaging hub; but criticized its application ecosystem, cloud capabilities and the immaturity of some features. Gizmodo's Kyle Wagner states that BlackBerry 10's home screen "gives BB10 the single best implementation of multitasking of any mobile OS right now". Wagner goes on to say that the Hub "works out to function a bit more like a junk drawer". He also reports what he refers to as the "Tragic Flaw": "Unlike every other major OS right now, BlackBerry does not feel fully integrated.". Wagner's review was based on the BB 10.0 and since the initial reviews of BB10 the OS has been updated several times and for many the issues have been addressed. In comparison to that, at launch, CrackBerry.com views the new features more positively and takes into account the fact that the OS is brand new. It says that the BlackBerry Hub "is a polished solution to efficiently managing the influx of messages we have coming at us...". It goes on to mention minor discrepancies and finally pointing out that many of the problems are getting fixed in future updates (some now released, e.g. battery life improvements, call ringtone disabled in bedside mode). It criticizes the limited customization options compared to BlackBerry OS (Alert tone volumes, alert light colour). Regarding the apps in BlackBerry World "really impressed by the quality of apps BlackBerry World has to offer", it notes that the application ecosystem is not as large as Android and iOS because of its age (brand new) and finishes with "doubtlessly many more will come around once they see the Z10 getting traction in the wild." Its general summary of BlackBerry 10 (with thought for its predecessor) "is that BlackBerry 10 really is the best of the old and the best of the new assembled seamlessly into an elegant, practical, and integrated package." As of Q2 2013, the new BlackBerry 10 platform had almost the same number of developers using the platform as the legacy BlackBerry 5/6/7 had just before the release of BlackBerry 10. Within a few months from its launch, the BlackBerry 10 platform was used by approximately 15% of mobile developers. BlackBerry 10 added a compatibility layer for Android software, which allowed developers to repackage their Android apps for distribution on BlackBerry World, however this advertised feature has received a poor reception as the Android apps "performed abysmally on the phone. Sluggish, ugly, and disconnected from the core OS. In fact, because these apps are being run in a software emulation of Android — Gingerbread no less (that's version 2.3) — they bear little to no relationship to the rest of the operating system". Later versions added the ability for users to manually install Android app packages. Beginning with the BlackBerry Passport, Amazon Appstore was bundled with BlackBerry 10 to provide an additional source of third-party Android software. BlackBerry CEO John S. Chen hoped that Amazon's own smartphone, the Fire Phone, would bolster the adoption of the Amazon store and attract more major developers to it, and in turn, BlackBerry's ecosystem. However, the Fire Phone was a commercial failure, which led to BlackBerry's decision to develop an Android phone of its own, resulting in the BlackBerry Priv. (BlackBerry 10 release version) See BlackBerry 10 for features. Has been released on the BlackBerry Z30, Z10, Q10, Q5. WiFi Direct and Miracast (Q10/Z30). Bluetooth 4.0 low energy interface for cars, heart rate monitors, etc. Camera enhancements e.g. focus lock and faster picture sharing. Smart Tag triggers, enhanced list of triggers. Lock screen notifications, for all types of notification. Browser enhancements; improved reader mode and faster access to history. Will also run apps from Android (4.2.2) Jelly Bean. Multiple Alarms are settable in the clock app. Priority Hub, learns to summarise which messages are important to you. Instant Preview & Reply, works whatever app you are in. (Toast notifications). Free Task Manager/Device monitor app. Easy "I will be late" meeting notifier. Custom Easy SMS/BBM reply for ignored phone calls. Support for web iCal calendars. Improved text selection, word processing & editing in and between apps. Keyboard sounds improved to differentiate "Shift", "Symbols" & "Backspace". Adaptive sharing feature, for quicker sharing of anything. Enhanced audio experience, and audio codecs. Attachment View, for finding things easily without opening mailboxes. Unlimited number of apps now allowed to run in background. Released on November 30, 2016 as an OS update. NIAP security certification, certifying government grade security. "Download complete" notifications are now pushed by the browser in the status bar and Hub. Released to Verzion and Bell devices on June 1, 2018, possibly on all Blackberry 10 devices and on all carriers Bug fixes, Stability and Performance improvements, Blackberry 10 OS Security patches. ^ "BlackBerry 10: Re-designed, Re-engineered, and Re-invented". BlackBerry Limited. January 30, 2013. Retrieved January 7, 2016. ^ "BlackBerry OS 10.3.3.3216 autoloader files now available". CrackBerry. April 4, 2018. Retrieved May 8, 2018. ^ "BlackBerry OS 10.3.3.3216 autoloader files now available". CrackBerry. April 4, 2018. Retrieved April 4, 2018. ^ "Research In Motion to Acquire QNX Software Unit from Harman International". BlackBerry Limited. April 9, 2010. Retrieved January 7, 2016. ^ "End of Support Notice". BlackBerry Developer. April 15, 2014. Retrieved January 7, 2016. ^ "An update for BlackBerry® 10 Developers". BlackBerry Developer Blog. October 26, 2015. Retrieved January 7, 2016. ^ Chen, John (January 8, 2016). "Showing Our Commitment to BlackBerry 10 at CES 2016". Inside BlackBerry. Retrieved February 13, 2016. ^ a b c d "BlackBerry announces at least another two years of support for BB10 and BBOS users". CrackBerry.com. Retrieved 2017-12-17. ^ Kharpal, Arjun (25 February 2017). "TCL launches new $549 smartphone under BlackBerry's banner, featuring Android software". CNBC. Retrieved 3 January 2018. ^ Lawler, Richard. "RIM loses BBX trademark battle, next OS is named BlackBerry 10". Engadget. Retrieved 7 December 2011. ^ Spoonauer, Mark (12 November 2012). "BlackBerry 10 launches Jan. 30 with two new phones". NBC News. Retrieved 12 February 2013. ^ "BlackBerry PlayBook tablet will get BlackBerry 10 update". Ars Technica. 30 January 2013. ^ "LinkedIn for BlackBerry 10 being retired on November 27". CrackBerry.com. 2017-10-30. Retrieved 2017-12-17. ^ "FYI: Built-in Dropbox app on BlackBerry 10 no longer works, try these apps instead!". CrackBerry.com. Retrieved 2017-12-17. ^ "Evernote will discontinue support for Evernote for BlackBerry 10 as of June 29". CrackBerry.com. 2017-06-26. Retrieved 2017-12-17. ^ Ion, Florence (2013-02-06). "Review: BlackBerry 10 is better, much better, late than never". ^ McCann, John (30 January 2013). "BlackBerry Hub, BBM and keyboard". TechRadar. p. 2. Retrieved 12 February 2013. ^ "BlackBerry 10: A Compelling Introduction." PC Magazine Online 30 Jan. 2013. General OneFile. Web. 12 Feb. 2013. ^ a b "App features". BlackBerry Developer. Retrieved January 8, 2016. ^ a b Kastrenakes, Jacob (June 18, 2014). "BlackBerry will bring thousands of apps from Amazon's store to its phones". The Verge. Retrieved June 18, 2014. ^ a b c Segan, Sascha (January 31, 2013). "How BlackBerry 10 Runs 28,000 Android Apps Without a Back Button". PC Magazine. Retrieved 18 June 2014. ^ Halliwell, Donny (May 14, 2013). "BlackBerry Live 2013 Keynote Highlights and Announcements [VIDEO]". Inside BlackBerry. Retrieved January 8, 2016. ^ Parr, Ben. "BlackBerry Colt: Say Hello to RIM's First QNX Phone [REPORT]". Mashable. Retrieved 2018-06-29. ^ a b Reed, Brad (2013-12-23). "Awful sales forced BlackBerry to cancel two phones planned for 2014". BGR. Retrieved 2018-06-29. ^ "Meet the man who would make BlackBerry apps cool". Retrieved 2013-02-28. ^ "BlackBerry 10 Dev Alpha Device – Announced from Thorsten Heins | BlackBerry Empire". Archived from the original on 2012-05-06. Retrieved 7 May 2012. ^ "Hands-on with the BlackBerry Dev Alpha B, is it the L-Series in disguise?". The Verge. Retrieved September 25, 2012. ^ "This is an A-B Conversation. Well, C Too". blackberry.com. ^ "Extending the Deadline for Built for BlackBerry". Retrieved 2013-02-28. ^ "BlackBerry, Rebuilt, Lives to Fight Another Day". Retrieved 30 January 2013. ^ "BlackBerry Z10 Review: Not Good Enough". Gizmodo. Retrieved March 19, 2013. ^ "BlackBerry Z30 User Reviews - CNET". CNET. CBS Interactive. ^ "Mixmag - BLACKBERRY Z30". mixmag.net. ^ a b "BlackBerry Z10 Review". 30 January 2013. ^ "Sweet Dreams! Bedside Mode now allowing you to sleep well and not miss calls thanks to latest BlackBerry 10 update". ^ Topolsky, Joshua (30 January 2013). "BlackBerry Z10 review: a new life, or life support?". ^ "BlackBerry: Run Your Android Apps Here!". PC Magazine. Retrieved 18 June 2014. ^ "BlackBerry bets on Android's apps to buoy new Priv". The Globe & Mail. Retrieved 26 September 2015. ^ "Re: Just updated to OS 10.0.9.2372". blackberry.com. ^ "BlackBerry 10 software updated to 10.0.10.85: Top 5 Improvements". blackberry.com. ^ "BlackBerry 10.1 Now Available for BlackBerry Z10". blackberry.com. ^ Denninger, Karl (May 3, 2013). "Sneak Peek: BlackBerry 10.1 OS". The Market Ticker. Retrieved June 16, 2013. First, password paste into system fields has been fixed. If you have a password "safe" reload that first and then the rest becomes easy, since you can now paste in your seutp information for Facebook, Twitter and such. ^ "Software version: BlackBerry Z10". t-mobile.com. ^ "Select your region - Telus.com". telus.com. ^ "AT&T finally rolling out BlackBerry 10.1 update for the BlackBerry Z10". 9 July 2013. ^ "A New BlackBerry 10.1 Update Available Starting Today". blackberry.com. ^ "How to Get BlackBerry 10.2 on BlackBerry Z10 and BlackBerry Q10 - Inside BlackBerry". blackberry.com. ^ "Official announcement: BlackBerry 10.2.1 is here - Lets you do more, more easily". ^ "Vodafone now rolling out OS 10.2.1.2141". ^ Lucas Atkins. "AT&T Rolling Out BlackBerry Z10 OS 10.2.1.2179". N4BB. ^ "BlackBerry OS 10.2.1.2228 Now Available for All (Thx T-Mobile!)". BerryReview. ^ "Sprint finally rolls out BlackBerry 10.2.1". ^ a b "BlackBerry issues important software update: BlackBerry 10.2.1 - Inside BlackBerry". ^ "The BlackBerry Runtime for Android Apps Just Got a Whole Lot Sweeter". ^ "BlackBerry 10 receives a minor software update in preparation for 10.3.1 later this year". mobilesyrup.com. ^ "BlackBerry OS 10.2.1.3247 now rolling out officially". ^ Lucas Atkins. "BlackBerry Z30 OS 10.2.1.3289 Now Available from Verizon". N4BB. ^ "BlackBerry OS 10.2.2.1531 now rolling out regionally". ^ "10.2.2.1609 (sw 10.2.2.984) - BlackBerry Forums at CrackBerry.com". ^ "BlackBerry OS 10.2.2.1531 now rolling out regionally". CrackBerry.com. ^ Bilaal Saghir. "Official OS 10.3.0.1154 for the BlackBerry Passport is now available via Indosat". BlackBerry Empire. ^ "Rogers rolling out OS 10.3.0.1418 for the BlackBerry Passport". CrackBerry.com. ^ "Android runtime supports only 2 cores!". Crackberry.com. ^ Gabriella Massara. "The BlackBerry Classic will have OS 10.3.1.1154". MondoBlackberry.com. ^ JT Teran. "BlackBerry OS 10.3.1.2072 Rolling out for Rogers' Classic - N4BB". N4BB. ^ Lucas Atkins. "BlackBerry OS 10.3.1 Officially Launched!". N4BB. ^ [ "BlackBerry OS 10.3.1.2558 update files now available for download". CrackBerry.com. ^ Lucas Atkins. "BlackBerry OS 10.3.1.2576 Live Links". N4BB. ^ "BlackBerry OS 10.3.1.2708 now available through several Canadian carriers". CrackBerry.com. ^ "10.3.2.440 being pushed to devices". ^ "Several Canadian carriers have now officially released BlackBerry OS 10.3.2". ^ "BlackBerry officially rolls out OS 10.3.2.2876 globally". CrackBerry.com. ^ "BlackBerry OS 10.3.3.2049 autoloader files now available as OS goes official". CrackBerry.com. Wikimedia Commons has media related to BlackBerry 10.